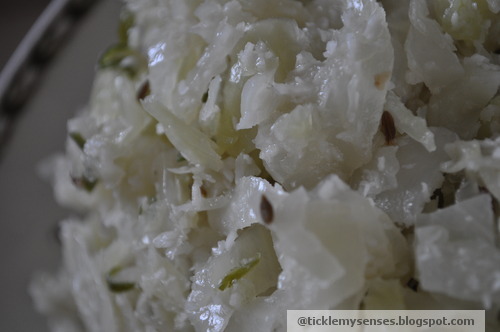 Tickle My Senses: Sauteed Cabbage with Chilly, Ginger and Coconut/ Cabbage Sukke- The Express Way! Sauteed Cabbage with Chilly, Ginger and Coconut/ Cabbage Sukke- The Express Way! Well you know those days when you trying to keep up with a budding baby whose just learned to crawl, have a pile of clothes sitting in a corner, carpets that have seen better days and a whole load of mail that needs to be acted on.....well on such days the last thing on my mind is to COOK!! Hmmm....all said and done......life goes on .......and so the reason for me creating this recipe. I had a cabbage that needed doing and as I said I wanted a quick simple recipe with no fuss... as one of my favourite celebrity cook Nigella rightly puts it -Cooking the Express way!! I simply finely sliced up the cabbage and onions and put them in a vessel, chopped up some green chillies and ginger finely, put them into a mortar with some cumin seeds and coarse sea salt... and started banging away ( trust me ...very therepeutic ;) a minute later added a handful of coconut to the coarse mix and continued banging for a minute more...and then I was done. Please try it to believe it.......and tell me how you liked it.........!! 1. Finely slice cabbage and onion. Place in a vessel. 2. Finely chop green chillies and ginger. Pop it in the mortar along with cumin seeds and coarse sea salt and pound it well for a minute to release all the juices. Then add the coconut and pound for one more minute. 3. Add the pounded mixture to the cabbage, 3tsps oil and mix well ( use your fingers give the cabbage a good massage with the spices) , make sure to wash your hands well afterwards. 4. Add 3 tbsps of water to the cabbage and keep it on a medium to high flame to cook, Close lid. Check in 3 minutes, give the cabbage a good stir. Check again in another 5 minutes. Do not overcook, I prefer a slight crunch. Check for seasoning. Stir well. If you do have the time a tadka wih 1/2 tsp mustard seeds and 1/4 tsp urad dhal will give a new dimension to the dish. 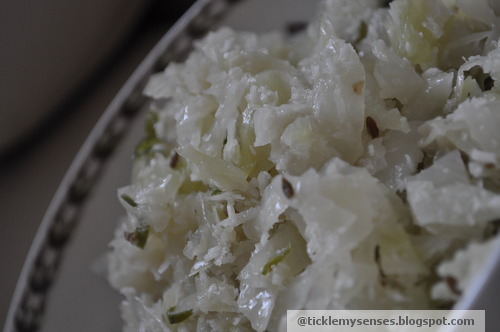 Serve with plain rice , daalisosaar and pickle. Enjoy.